If you think about it, you can’t get much done. So you don’t think about it. You just shake your head and keep tapping on the computer; the next patient awaits. To avoid moral distress, to remain employed as a doctor, you don’t think about the high cost and waste of cardiac care. 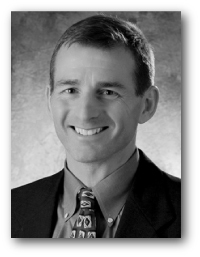 Dr. Andrew Foy is a friend and cardiology researcher at Penn State College of Medicine. He and I wrote about the rising economic burden of delivering cardiology care in the United States. What follows is a summary of our chapter published in the academic journal Primary Care Clinics. We first put numbers to what everybody sort of knows: heart disease is a major health problem and it costs bunches to treat. Men, for instance, have a 1 in 2 chance of getting heart disease over a lifetime. It’s a little less (about 1 in 3) for women. In the US we spend about $457 billion on cardiac care. For reference, that is equal to more than half of what the US government spent on education ($812 billion); more than two-thirds of what it spent on defense ($622 billion); and more than what was spent on welfare ($320 billion) and transportation ($229 billion). The second part of our chapter considers how these growing costs affect people. The short answer is…negatively. Higher costs of care mean higher insurance premiums. We found evidence that higher costs of insurance premiums play a major role in wage stagnation. Think about it: you get a higher salary, but your employer extracts more to pay for insurance. The net is no gain or less gain in take-home pay. Another negative effect of higher costs is the threat to government programs like Medicare and Medicaid. We explain that Medicare spending has far exceeded its originally intended revenue source of payroll taxes, requiring ever-increasing premiums and general revenue transfers to maintain solvency. Medicaid is even more vulnerable because it’s run by states, which cannot operate deficits and therefore limit costs by reducing payments. Herein lies the worst part of wasteful care: overuse exacerbates underuse and inequity of care. The second half of the chapter explores the causes of expensive cardiac care. Three big factors here include 1) an aging population, 2) tech advances, 3) supply induced (flat-of the-the curve) medical care and its resultant medical overuse. While life expectancy has increased about 13% (6% for women) over the past half-century, spending on health care has increased more than five-fold. What’s worse is that most experts think direct spending on health care contributes only about 10% toward population health. The question is: why do Americans spend so much for so little? And the answer—at least in cardiac care—is that the fee-for-service system is perfectly designed to deliver the results it achieves. In this model, those who provide and pay for care have little incentive to restrain service use and/or limit unnecessary costs. 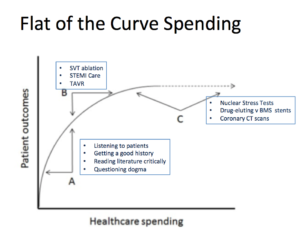 Here is where we introduce flat-of-the-curve medicine. These are medical practices that create little to no health benefit. Flat-of-the-curve medical care is “supply-induced.” This means it’s driven by supply rather than demand. 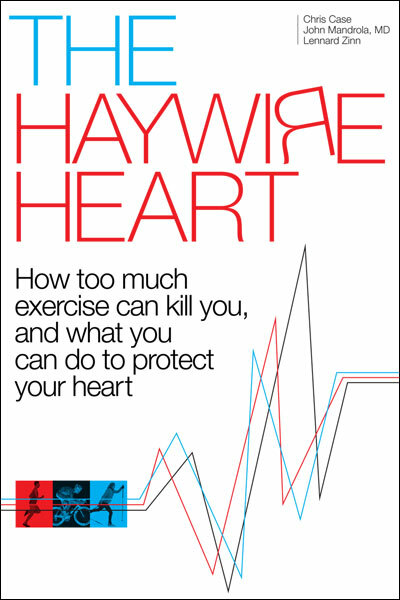 Cardiac stress testing provides a great example. Stress tests come in many varieties: a plain treadmill test is least expensive while stress tests that use drugs and echocardiograms or nuclear scans are far more expensive. In general, all stress tests perform roughly the same—they are designed to detect blockages and help sort out the risk of future events. In a normal market, the cheapest test would be the most common. But that’s not what happens in a fee-for-service system. Doctors order far fewer regular stress tests. One study we cited reported it was 65% to 14% for nuclear vs regular stress tests. The use of tests to find heart disease has greatly expanded over the last two decades. Consider that the percentage of nuclear stress tests with evidence of blockages has declined from 30% to 5%. Think about that: we are doing more testing and the vast majority are negative tests. That defines flat of the curve practice. Big costs but no benefit. We used data from a paper in the journal Circulation to make that image. Doing more cardiac procedures used to diagnose and treat blockages have not associated with a reduced the rate of heart attacks. More flat-of-the-curve practices. 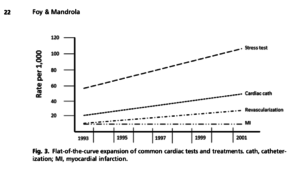 One reason is that cardiac tests are driven by supply rather than demand. We cited a study showing that use of cardiac procedures in elderly patients after heart attack had risen more rapidly in the United States than in Quebec–but both areas had equal declines in death rates. Another group found rates of stent implants (for stable conditions) was 2.3 times higher in New York compared with Ontario. The authors speculated this may have been due to a higher density of interventional facilities in New York. I’ve seen this during my career. Hospital systems build a hospital and business comes. That would be fine if there was a signal that it improved outcomes. We can’t find one. This is not right. Cardiology care should be driven by demand not supply. 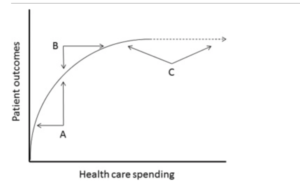 Continued growth in health care spending limits spending in other areas, and although physicians may not be able to directly change health policy, they can limit unnecessary spending by avoiding flat-of-the-curve practices and optimizing the use of tests and procedures. To patients and to my colleagues: please think about that curve. Is the stuff you are doing on the steep part of that curve or the flat part. If it’s on the flat part, consider doing less of it. It’s like turning off your lights when you leave the house. Not wasting money is the right thing to do. References can be found in the chapter, which I hyperlinked above. Foy AJ, Mandrola JM. Heavy Heart: The Economic Burden of Heart Disease in the United States Now and in the Future. Primary Care: Clinics in Office Practice. 2018;45:17-24. How can there be a true supply-demand curve when neither the patient nor the doc/hospital knows the cost of the product or service? While these articles are interesting, your earlier columns were far more informative re heart issues I.e. afib etc. Dr. Mandrola; please run for public office. The issue of health care insurance is completely an exercise in futility when we are trying to insure a product that is used so inefficiently (healthcare). It is criminal that people who have no idea about health are trying to solve this debate. My understanding is that in an efficient free market, consumers have a high level of knowledge about what they are consuming/purchasing or accurate knowledge of the service provider. In an efficient market it it is easy for them to switch between products/providers and it is very easy for them to compare quality and cost. This may be true for fast food but almost none of this is true about the health care market or only to a very limited degree. Thus there is little competition. Allowing health care to be run by private enterprise in these circumstances is a recipe for enormous expense. Completely agree with you on the flat of the curve cardiology practices being largely supply induced than actual demand, this is more of a commercial business than actually something benefiting patients and giving them a huge value for money.